Start out going East on ramp. Merge onto AIRPORT EXWY (Portions toll). Take the I-95 N/I-95 S exit towards FT LAUDERDALE/ORLANDO/DOWNTOWN. Stay straight to go onto I-95 NORTH/SR 9A NORTH RAMP. Take the exit, exit number 12, NW 135 Street. Turn SLIGHT LEFT onto W DIXIE HWY/FL-909. Stay in the center lane. The ramp ends at a traffic signal. Keep going straight at the Dixie Highway intersection. Turn LEFT at NE 149TH ST.
Head WEST onto NE 163RD ST. Turn RIGHT onto W DIXIE HWY/FL-909. Turn LEFT onto NE 18TH AVE. Turn LEFT onto NE 149TH ST.
Head North onto I-95 N.
Take exit number 12, towards SR-924/N W 119TH ST.
Stay straight to go onto NW 6TH AVE.
GRATIGNY RD/NW 119TH ST/FL-924 becomes NE 119TH ST/FL-924. Turn LEFT onto W DIXIE HWY/FL-909. 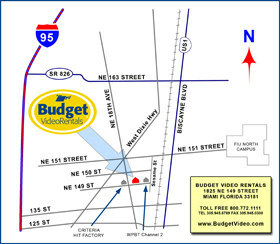 Turn SLIGHT RIGHT onto NE 125TH ST/N MIAMI BLVD/FL-922. Turn LEFT onto NE 6TH AVE/FL-915. Turn SLIGHT RIGHT onto W DIXIE HWY/FL-909. Turn SLIGHT RIGHT onto NE 149TH ST.